Contractors work hard, and so the insurance they have on their heavy equipment should also work hard when it needs to. Your business uses heavy machinery like excavators, front loaders, lift trucks and bulldozers, and like any other machinery, breakdowns happen. The last thing you want is your operations stalled because of equipment woes. After all, a big chunk of your assets are in the equipment, so protecting it from damage or loss is more than likely a high priority for you. Cover equipment against fire, spontaneous combustion, explosion, lightning strikes, theft, fraud and misappropriation. You will also want to look for a policy that provides a rental reimbursement limit of $500,000 and a $500,000 coverage limit for rental equipment. Contractors should search out insurance companies that specialize in heavy construction contractor risks, like rigging services, machinery and equipment moving, millwright, crane operation with or without an operator, etc. The experts at Truck Loan Center can give you advice on which insurers have heavy equipment expertise and a comprehensive understanding of the issues heavy equipment owners and operators face. The National Insurance Crime Bureau in the United States says that equipment thefts is the main reason for heavy equipment insurance claims, with the three most stolen items being riding or garden tractor mowers, loaders and tractors. John Deere equipment has been the main theft target, followed by Kubota Tractor Corporation, Bobcat, Caterpillar and Toro. Use locks. Hydro and sleeve locks make it tough for thieves. 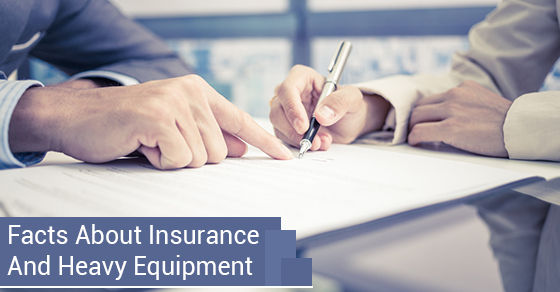 Your equipment insurance should follow your equipment. Wherever jobs take you, you shouldn’t have to worry about potential problems, like hitting hydro lines, or sweat the smaller stuff, like possible broken windows. So make sure you contact the right insurance group to insure your heavy equipment.